Let’s me start with this. A Brief History of Time is straight up Science. Not boring like a text-book but strictly science all the same. My impressions of Stephen Hawking and this book before I read it was that he was going to be dogmatic about how right he is about his science, the way he believes the universe began, and how ignorant Christians are about believing their simple, little, science-free, evidence-free, view of a literal, seven day creation by their Intelligent Designer, God. And…I was wrong. (Unless he did that in such an intelligent way that I just didn’t catch it. And that is totally possible). So I went into this read like I have with some others on my challenge list; with the mindset of “I’m not drinking any Kool-aid here, I’m just checking this baby off the list”. That’s not to say I’m not taking it seriously or genuinely “listening” to what my writer has to say, though. I know that I have plenty to learn from others, especially those who are experts in their field, but some things are pretty settled with me, and the Origin of the Universe is one of them. I don’t have to understand how God did it, but I’m confident He did. I have complete respect for those who make it their life’s work to study and understand the things of this world. I can’t tell you the difference between a proton and a particle or a singularity and an event horizon, but dude, Mr. Hawking can, and he does it in the most gentle and conversational way. This whole book was pleasantly conversational and he was just as kind and patient in his teaching as he could be. Really. “There are something like ten million million million million million million million million million million million million million million (1 with eighty zeros after it) particles in the region of the universe that we can observe.” (I just thought that was ridiculously funny). “So long as the universe had a beginning, we could suppose it had a creator. But if the universe is really completely self-contained, having no boundary or edge, it would have neither beginning nor end: it would simply be. What place, then, for a creator?” My thoughts: The God I know as creator has no beginning or end so that makes perfect sense to me. His creation is consistent with His nature. I love that Hawking was very open about mistakes that he and other scientists have made in their research. Not because I don’t expect him to find himself wrong on occasion but because it reveals the “practicing” nature of science. It proves that we are always learning more and more, no matter how much knowledge we attain, there is always more. He says, “A good example of this was Einstein, who called the cosmological constant, which he introduced when he was trying to make a static model of the universe, the biggest mistake of his life.” Guys, we’re just not meant to figure it all out. A Brief History of Time makes it’s appearance in Season 3 of LOST when Aldo, one of “The Others”, is sitting guard outside one of the Dharma research facilities. Inside they are holding Carl hostage, doing all kinds of horrible mind experiments on him, sending him subliminal messages through neon goggles as punishment for having a secret teenage romance with Ben’s daughter, Alex. If you watched the show you know all about this, if not, I’m sorry for all that. Anyway, our LOSTies sneak up on Aldo while he is reading and attack him in order to rescue Carl. And that is pretty much all you see from that book on the show. There is one other time where it is lying on Ben’s coffee table but it doesn’t receive any attention. 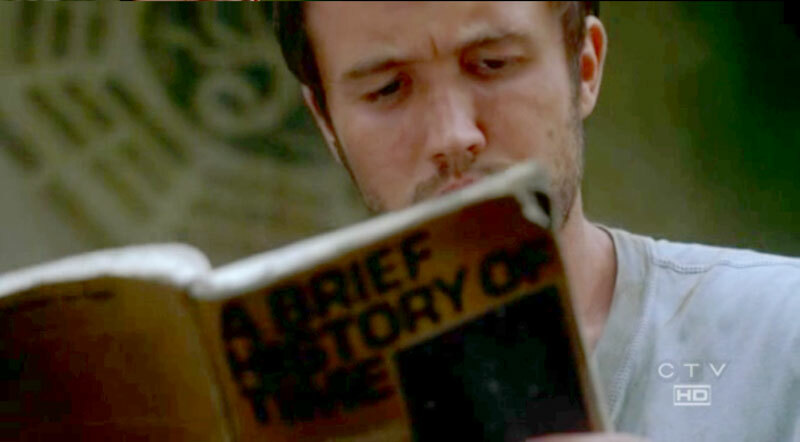 (Spoiler Alert) It’s obvious now that LOST featured this book as foreshadowing to the 5th season where the characters spend several episodes traveling through time. But even if they didn’t, the “Others” and the Dharma Initiative were all sciencey anyway. Somebody would’ve read it. And now, I can say that I’ve read it. And I’m pretty doggone proud of myself for it. And here is something else I learned. Maybe you already knew….but I learned that scientists who follow the Big Bang Theory also believe there will be a Big Crunch at the end. The universe that is now, and has been expanding, will eventually snap back into a Big Crunch. Well, I can only speak to this book, which was written in 1988. I must have gotten my negative impression from something I saw or heard within recent years. But I found this piece of work not hostile at all. Let me know your thoughts when you get to it!